We are builders, engineers, obsessives, hackers, tinkerers, coders, experimenters, with a broad range of experience in game development and design, systems engineering, mobile application development, and social integration. KittyHawk co-founders, Joe Schorn and Richard Narvadez, have over two decades of technical development experience between them working with big brands and within highly specified technical requirements. 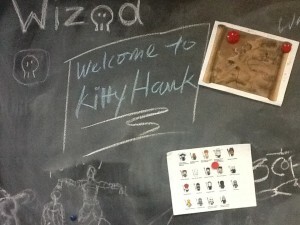 Richard Narvadez brings over 10 years of interactive and technology project management to KittyHawk. He is responsible for the implementation, facilitation and overall program management of KittyHawk's interactive projects. Richard is passionate about building high performing, cohesive, cross-functional teams that deliver sustainable value and speed time to market. Throughout his career, his strong background in technology management, analytical, organizational, and facilitation skills, he has been able to consistently deliver a high level of efficiency and transparency to complex online projects. Joe Schorn is creative software engineer with more than 10 years experience in game development and design, systems engineering, mobile application development, and social integration. Joe has developed web and social applications for brands such as Panasonic, American Express, Famous Footwear, Ciao Bella Gelato, and Pert Shampoo, to name a few, as well as game development for iOS. Joe also has extensive experience in interactive video and streaming media technologies. In addition to Joe's development skills he has a strong sense of creative design and building intuitive user experiences.